Hibs boss Alan Stubbs today revealed he hopes Farid El Alagui will be out for half the time first feared after the striker had “cutting edge” surgery on his ruptured Achilles tendon. 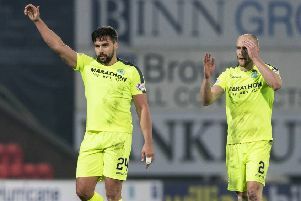 One of the country’s leading specialists operated on the 29-year-old in Glasgow’s Ross Hall Hospital using a new procedure which, the Easter Road club have been told, should significantly reduce the time he will be out of action. The former Falkirk hitman could still be sidelined for up to six months after suffering the injury on landing awkwardly on Alloa’s artificial pitch on Saturday, but Stubbs said he could otherwise have been out until the start of next season. Despite the international break, Stubbs’ players have been following their normal training routine, with the head coach determined to make the most of the time available.